When you are a locum pharmacist, most of your shifts will be close to your hometown, or perhaps even in it. The majority of locums travel between 30 and 60 minutes to get to and from work everyday, or somewhere between 20 and 50 miles, making it similar to many other career commute times. However, being locum gives you a certain range of flexibility. You can work when you want, as long as you want, and yes, wherever you want. For some people, a half hour commute is enough. Others, however, like to go further afield - so far, in fact, that they won’t be commuting again until the next day, or perhaps even the end of the week. These stay-away shifts aren’t for everyone, particularly those with daily responsibilities in the home or with family, but many locums find them to be some of the most exciting and rewarding in their calendars. Few fixed positions allow you to travel quite as much as locums do. If you are the sort of the person constantly itching for exploration, then perhaps the stay away shift will suit your runaway nature. Locate a Locum has over 1400 registered pharmacies across the UK - meaning that you have quite a selection of different workplaces where you can pick up shifts. Locum pharmacist Stephen McGonigle told us that his career as a locum pharmacist had allowed him to see much of his home country, Scotland, as well as parts of England and Ireland as well. Locum pharmacist Artwell Kufa told us that his favourite part of stay away shifts is being exposed to new environments in different towns. Getting away from the hometown bubble is always good for widening one’s understanding and building upon your skills, and locum work is no exception. For example, as a pharmacist you should already have good communication skills, but how do those skills stand up against a different accent, or sense of humour? Even if your travel has only taken you a few hours south of your normal area of work, you might find the accent, slang and pace of life to be fascinatingly different. Your apartment, townhouse or little cottage in the country may not be particularly close to your local pharmacy or hospital. In fact, it might take an hour or two of commuting everyday just so you can get to your job, like 17% of locum pharmacists in 2018. With a stay away shift, though, you get to book your own accommodation, and it can be anywhere you like. Artwell said that his commute distance is actually much shorter when working a stay away shift, as he usually books accommodation near the stores he has shifts in. That means that while he is miles from home, his commute has been significantly reduced. Many locums might find it a pleasant change to commute by walking, or simply shortening a forty-five minute drive to a ten-minute train journey. It’s all up to you. Of course, stay away work has its downsides, too. There’s accommodation to book, discomforts to endure, and of course, you do have to travel back home whenever the work is done, which might be some distance. 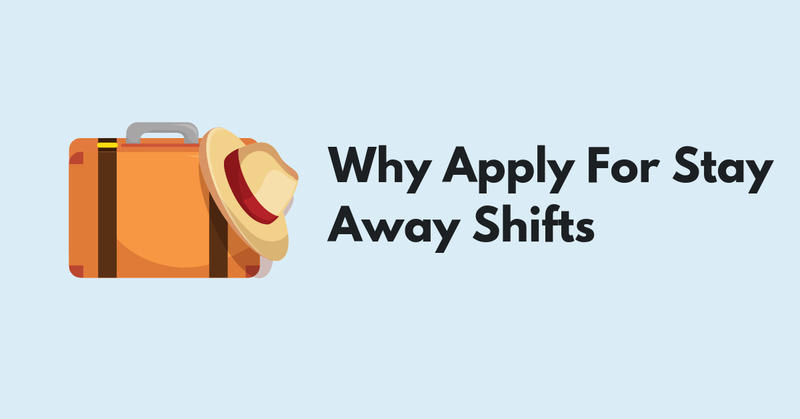 Particularly, if you are more of a homebird, you could find the stay away shift more stressful than others, and not the best fit for you. However, one of the best things about being a locum is that it’s your choice, and for lots of adventurous locums, with minimal hometown responsibilities, these stay away shifts are the perfect balance of work and adventure. If you want to know more about stay away shifts, please do not hesitate to contact us at Locate a Locum.